No. 13 UCF didn’t get much of a test from Pitt on Saturday, rolling to a 45-14 victory in front of an announced crowd of 44,904 at Spectrum Stadium. The Knights (4-0, 1-0 AAC) have now won 17 straight games, which still stands as the nation’s longest active streak. 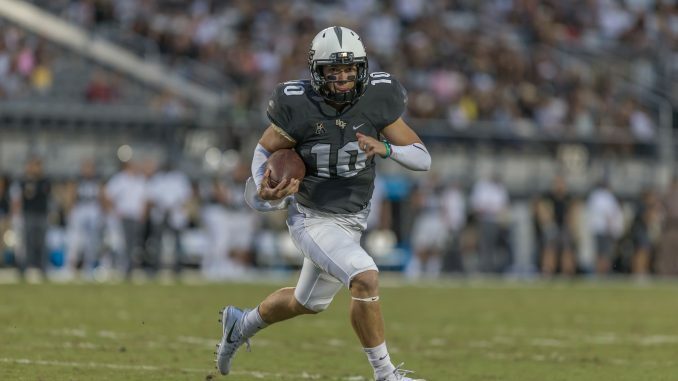 Quarterback McKenzie Milton started the scoring with 6:52 left in the first quarter, running for a five-yard touchdown. Less than three minutes later, he connected with Gabe Davis for a 24-yard score to give UCF an early two-possession lead. The Knights were strong on defense early, but an 85-yard punt return for a touchdown by Rafael Araujo-Lopes got the Panthers (2-3, 1-1 ACC) on the board late in the opening quarter. From there, UCF continued to dominate on offense and stand strong on defense. Ten seconds into the second quarter, Milton picked up another rushing touchdown, this time from 23 yards out. After Milton and Michael Colubiale connected for another score, Matthew Wright added a 21-yard field goal to give the Knights a 31-7 lead heading into halftime. Pitt mustered up just 114 yards in the first half and was penalized eight times for 92 yards. Small mistakes added up and UCF capitalized to find a lot of separation heading into the locker room. The Knights started the third quarter by picking up right where they left off before the break, picking up a defensive stop before finding the end zone again on a 71-yard pass from Milton to Adrian Killins. Both teams traded fourth-down misses to end the third quarter before UCF added to its lead midway through the fourth on a 13-yard pass from Milton to Otis Anderson. Pitt’s offense found the end zone for the first time with 4:46 left in the game as quarterback Kenny Pickett connected with Maurice Ffrench from 58 yards out. Milton finished the day with 388 total yards and six total touchdowns. Killins ran for just 40 yards on 12 carries, but caught three passes for 140 yards and a touchdown. Davis added four receptions for 80 yards and a score. The defense held the Panthers to just seven points and 272 total yards. UCF returns to Spectrum Stadium next Saturday (Oct. 6) to host SMU. Kickoff is set for 7 p.m.